This disease has been observed on watermelon in Knox County. 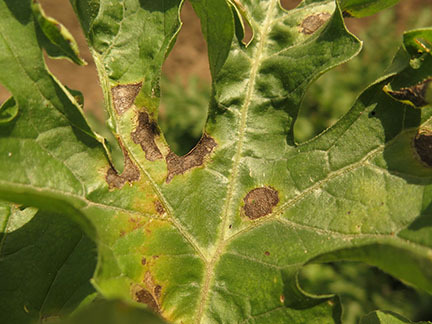 The following article will discuss the symptoms, biology and management of downy mildew of cucurbits. Symptoms. The symptoms of downy mildew vary depending on the host. On watermelon, the lesions start out as chlorotic (yellow) areas that become round and necrotic (brown/black) areas surrounded by a chlorotic halo. Lesions may be limited by veins (Figure 1). Note that leaf lesions of gummy stem blight may have dark fungal structures (pycnidia) present that are lacking with downy mildew. Also, whereas gummy stem blight will affect stems and petioles, downy mildew will not. Pumpkin lesions also start out chlorotic and are often angular. Eventually, the chlorotic lesions become necrotic. Lesions may be more common along a vein. Lesions on muskmelon often have poorly defined margins and are not as angular as described above for pumpkin. 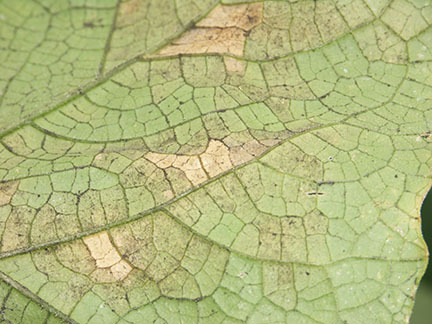 Cucumber lesions start out chlorotic and very angular, eventually becoming necrotic. For all hosts, the bottom of the lesions becomes covered with a dark ‘fuzz’ under moist conditions (Figure 2). The ’fuzzy’ appearance is due to the production of spores. Severely affected leaves become crumpled and brown and may appear scorched. Downy mildew does not affect stems or fruit directly. Downy mildew of cucurbits is favored by temperatures of 59 to 68°F. Relative humidity of 100% for 6 hours is sufficient to allow infection to take place on a leaf. Once infection takes place, spores are produced on the underside of the leaf. The spores are dislodged upon drying and easily become airborne. The fungus-like organism that causes downy mildew does not overwinter in Indiana; instead it overwinters on the Gulf coast or in cucurbit greenhouse production somewhere near the Canadian border. Usually, this fungus-like organism blows into Indiana in late August or September. This year’s entrance is unusually early. The fungus-like organism that causes downy mildew of cucurbits does not affect unrelated hosts such as soybean. There are several pathotypes of the fungus-like organism that cause downy mildew. Each pathotype specializes in a different set of cucurbit hosts. In most years, downy mildew shows up on cucumbers and cantaloupe first. Since, this situation is a bit complicated and isn’t entirely understood, I would advise all cucurbit growers in Indiana to begin the management options described below even if it is only to closely scout one’s field. While crop rotation is always a good idea, this management technique will not work for downy mildew since the causal organism does not overwinter in the soil. There are a few varieties that have resistance, but only for cucumbers. Most growers find it necessary to apply fungicides to protect their cucurbit crops. However, since the fungus-like organism that causes downy mildew is not closely related to the fungi which cause most other cucurbit diseases, the fungicides that are most effective against downy mildew are not necessarily effective against most other cucurbit diseases. (A very different fungus causes powdery mildew of cucurbits.) Products that can be used to manage downy mildew are listed in the Midwest Vegetable Production Guide. The most effective products are likely to include Ranman®, Gavel® and Zampro®. Growers who have been applying Presidio® for Phytophthora blight may find that this product is also effective against downy mildew. I have found Previcur Flex® to be effective, however, more recent data indicate this product to be less effective than the above products. Products that contain phosphorus acid (such as Agri-phos®, Phostrol®, Prophyt®, Rappart®) may help in situations where the disease is not present, but may threaten in the future. Contact fungicides such as those with the active ingredients chlorothalonil or mancozeb may not be as effective as the products listed above, but do offer some protection. Organic growers should use a formulation of copper that is certified for organic use. Dark “fuzz” on underside of leaf is caused by spores of the fungus-like organism.